BEIRUT (AP) — Russia's military said Monday it expects to reach an agreement with a major Syrian rebel group to arrange its exit from the last rebel-held town in eastern Ghouta in another key victory for President Bashar Assad's forces as they push to gain control of the region on the edge of Damascus. The town, controlled by the powerful Army of Islam, is also home to tens of thousands of people, including many who were displaced over the past weeks of heavy fighting. Lt. Gen. Stanislav Gadzhimagomedov told Russian news agencies on Monday in Syria that Russia's military is in talks with the Army of Islam to discuss its withdrawal from Douma. Gadzhimagomedov, who is the deputy head of the Chief Operational Department at the Russian General Staff, said he expects Russian troops to "take them out soon," and that the rebels have reportedly indicated their willingness to lay down arms. However, the Britain-based Syrian Observatory for Human Rights said there are divisions within the rebel group over the negotiations, with some hard-liners refusing any talks with Russians. The Observatory said some fighters asked to be allowed to go to the southern province of Daraa, but that the Russians rejected this request. Syria's pro-government Al-Watan daily said the Army of Islam and the Russians have reached an "understanding," adding that each side will study a draft agreement within the next three days. Al-Watan quoted Syrian legislator Mohammed Kheir Seiryoul, who is originally from Douma, as saying that the understanding could lead to an agreement to dissolve the Army of Islam. During this period, its members would hand over their heavy weapons and the Syrian government would assume control of state institutions in the town. A civilian committee representing Douma said in a statement released late Sunday after meeting Russian officials that the negotiations "are extremely difficult and no quick results should be expected." Talks with the Russians will resume within three days, it said. Douma-based opposition activist Haitham Bakkar said the town was subjected to some artillery shelling early on Monday that wounded several people. The negotiations on Douma came after thousands of rebel fighters and their families left three other eastern Ghouta pockets in the past weeks, after years of siege and weeks of heavy bombardment by the Syrian army and Russia's air force. 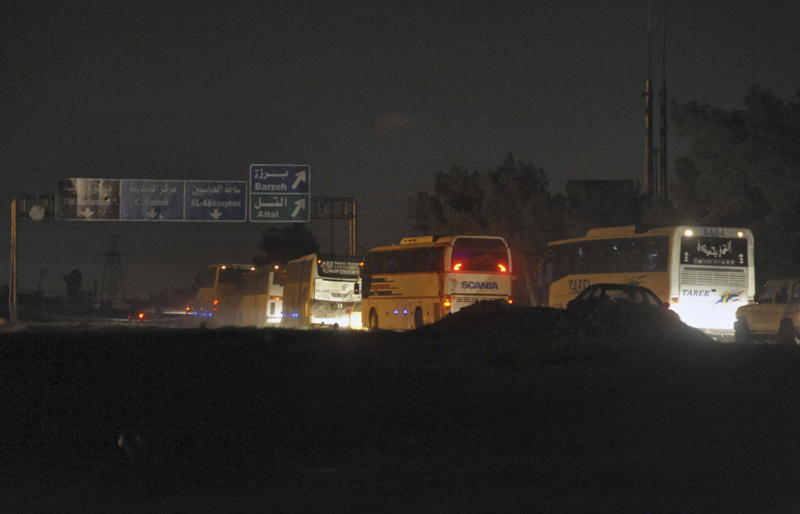 On Monday, a convoy of 56 buses carrying 3,641 people, including 850 fighters from various rebel factions, was preparing to leave the towns of Jobar, Zamalka, Ein Terma, and Arbeen toward Idlib, state-affiliated al-Ikhbariya TV reported. The Russian Defense Ministry's Center for Reconciliation in Syria said in a statement that more than 400 people left Douma early Monday. It put the total figure of civilians and rebels evacuated from the area since the Russia-sponsored "humanitarian pauses" were announced at 114,000 people. Army of Islam spokesman Hamza Bayraqdar blasted the group's former ally, the Faylaq al-Rahman rebel group, accusing it of helping government forces capture more than 80 percent of rebel-held districts after they dried out artificial swamps set up by insurgents to slow down the army's offensive. "We had defensive plans prepared, but regrettably Faylaq al-Rahman cut the water that was brought from Barada River," Bayraqdar told the Dubai-based Al-Arabiya TV. "This sped up the regime's advance."